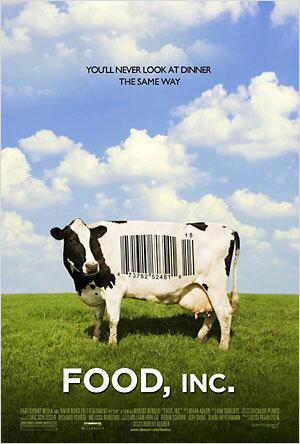 Teapots and Polka Dots: Food, Inc.
Food, Inc. is a new documentary that aims to expose major problems in America's food system and radically change the way we feel about our food. According to its official synopsis, the film "lifts the veil on our nation's food industry, exposing the highly mechanized underbelly that's been hidden from the American consumer with the consent of our government's regulatory agencies, USDA and FDA." It takles huge agro-businesses, GMOs, food safety, organics, obesity/diabetes, and how these topics are all politically intertwined. The movie opens today in Los Angeles, San Francisco, and New York (check this list for more openings), but I saw an advance screening at the Seattle International Film Festival a couple of weeks ago. I thought the cinematography was beautiful and the interviews were interesting and informative. Big names such as Michael Pollan (Omnivore's Dilema, etc.) and Eric Schlosser (Fast Food Nation) share screen time with farmers, ranchers, politians, businessmen, and activists. It does a good job of breaking a really complex topic into sections, like "corn," "politics," "meat," etc. That said, some parts of it made me a little squeamish, especially in the meat section. It's not awfully graphic, just kind of sad and a bit shocking to see all of those animals raised and processed as widgets on an assembly line. We all know that's what happens with most meat, and it's true that much of the organic/free range meat I eat isn't quite like that, but it's still a little in your face. Overall, I think it's a good movie and people should see it. With such a focus on issues within the meat industry, you could expect the appearance of the anti-Food, Inc. website SafeFoodInc.com. They describe themselves as "an alliance of associations that represent the livestock, meat and poultry industries,"and they take issue with the narrow view that the movie has taken, pigeon-holing most meat processing into huge evil corporate factories. They link to a lot of pro-meat websites to show that the American meat industry is humane, healthy, treats its workers well, etc. It's a viewpoint that I can at least understand, even though I do believe that a lot of this country's meat production is seriously lacking in those areas. But at least it's a reasonable claim, based on current food safety, animal cruelty, and workers' rights laws. -- Food prices—especially meat and poultry prices—would rise dramatically because of the increased costs of their inefficient production approaches. Americans spend far less of our money on food (and far more on healthcare, but that's another story) than do citizens of most developed nations. This is mostly because our food is artificially cheapened by government subsidies and economies of scale. I agree that organic farming is less efficient, but that's the point. There is a line that has to be drawn, where increased efficiency is not worth the other effects of ferilizers, pesticides, bacterial resistance, animal cruelty, etc. We've crossed that line, and I believe we have to pull back to a less efficient but better overall model. --Vast amounts of land would need to be used to raise livestock and poultry in free range systems. Yes, again, that's the point. But if we Americans could learn to eat less meat, we would be rewarded with healthier bodies and better farms. Decreasing factory-like efficency, raising food costs, and eating less meat are all good things, in my opinion. --The environment would suffer from open systems lacking environmental controls. Oh this is so wrong. So so laughably wrong. Hog farms create huge stinking cesspools that leach toxins into groundwater supplies and endanger the health of nearby populations, and organic farms are the ones lacking in environmental controls? Please. Organic farming reuses animal waste as compost, closing the loop of farm production. Let's just move on... this point is ridiculous. --Many fresh fruits and vegetables, which are seasonal in nature, would become unavailable in many areas of the country for much of the year. Hey, what a concept! You mean we're not supposed to have tomatoes in January? Or Asparagus in November? My local grocery store could've fooled me. But really, think about it: Did your grandparents have stone fruits in the winter or apples in the summer? Did your parents, even? No, probably not. And if they did, it was a huge treat, flown in small quantities from somewhere exotic and far away, like Florida. This is not the same thing as routine huge shipments of produce from New Zealand and Chile. It is so much more enjoyable, tastier, and downright cheaper to buy things from nearby and in season. It is illogical to assume that a Peruvian apple in the summer could have the same overall costs as a Washington apple in the winter; the former flew thousands of miles to get here! If they're equally available to me and cost the same amount at the store, there's a bigger problem hiding there. I'll stick with my Washington cherries, thank you, and wait until fall to eat apples again. --Imported foods like salamis from Italy, Danish hams and many other items would become "politically incorrect" because of the distances the products travel. Oh, wow. Just... wow. First of all, Food, Inc. makes absolutely no claims about the "correctness" of foreign foods; the movie focuses exclusively on the American food system. I don't expect international luxuries like jamon iberico to be cut from nice restaurants. Hell, I probably eat my own weight in French cheese each year. I personally don't think these things should be everyday staples, but that's not really what they are even now. But can we get back to the fact that this is the American meat industry talking, and they're complaining that European meat will be less available? Seriously? If some food lobby advocated importing and eating more Italian salami and Danish ham, the livestock companies would have an apoplectic fit. I find it really ironic that they're using this as a point in their favor. Bottom line is that while I don't agree with every point made in Food, Inc., I do disagree with almost everything their critics have to say. And that's good enough for me; I say show Food, Inc. to all!